Easter is just a few weeks away, my friends! So today's Spanish download from MommyMaestra sponsor, Spanish for You! comes at just the right time. If you are looking for an Easter-themed activity to incorporate into your Spanish lessons, this may be just the one you need! 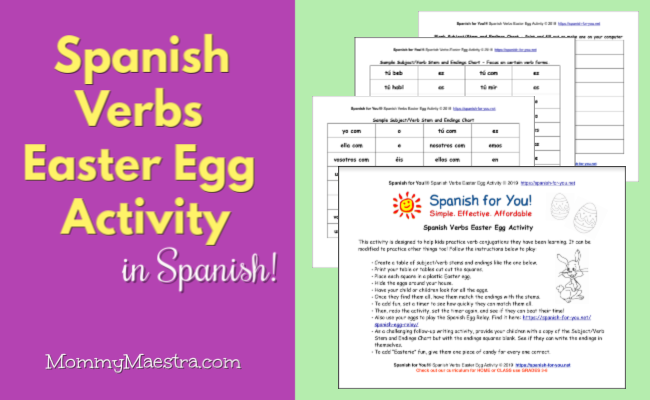 The Spanish Verbs Easter Egg Activity is designed to help students practice verb conjugations. The four-page download includes one page of directions and three different charts for subject/verb stems and endings. There's no audio file with this particular activity because there's really no need for one.